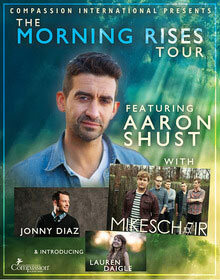 NASHVILLE, Tenn. - Feb. 7, 2014 - Dove Award winning singer/songwriter Aaron Shust is set to headline The 'Morning Rises' Tour, presented by Compassion International and hitting more than 20 cities this spring. Joining Shust as special guests will be acclaimed pop-rockers MIKESCHAIR, acoustic-pop songwriter Jonny Diaz and newcomer Lauren Daigle. Kicking off March 14, in Lewistown, Penn., The Morning Rises Tour will travel to Columbus, Ga.; Jacksonville, Fla.; Oklahoma City, Okla.; Carthage, Va.; Takoma Park, Md. ; and more before wrapping up in Dawsonville, Ga. on May 4. Shust will be touring in support of his current album, Morning Rises, produced by Dove Award winner Ed Cash (Chris Tomlin, Bebo Norman, Matthew West). Morning Rises released last summer to critical acclaim and features the hit songs "God of Brilliant Lights," "No One Higher" and "Cornerstone." Tickets for most dates on The Morning Rises Tour are on sale now, and a special VIP package is available at select shows, which includes premium seating and a pre-show Q&A with the artists. For the most up-to-date info and to purchase tickets, visit www.aaronshust.com. The Morning Rises Tour is presented by Compassion International (www.compassion.com), the world's leading authority in child sponsorship. Compassion revolutionized the fight against global poverty by equipping the Church to develop children out of poverty to become responsible and fulfilled Christian adults. Founded in 1952, Compassion now partners with more than 6,000 Christian churches in 26 countries to release more than 1.4 million babies, children and students from poverty. Aaron Shust exploded onto the Christian music scene in 2005 with his first album, Anything Worth Saying, which led to the artist signing with Brash Records. The second single from the project, "My Savior, My God," started generating airplay on its own and rose to No. 19 on the Christian Radio & Records chart before being released to radio. Once released, it shot to No. 1 on six charts by April of 2006. At the GMA Awards in 2007, Shust was honored with three Dove Awards for Song of the Year, Songwriter of the Year, and New Artist of the Year. Shust's second studio album, Whispered And Shouted, released in June 2007 and in 2009, Shust released his third and final CD for Brash Records, Take Over, which included the Christian radio hit, "To God Alone." Shust signed with Centricity Music in January 2011 and released his hit-making debut project, This Is What We Believe in August 2011. This Is What We Believe launched one of the biggest songs of Shust's career with "My Hope Is In You," which stayed at the top of the AC Monitor chart for 14 weeks. The critically-acclaimed Morning Rises, Shust's second release on the Centricity label, features the hits "God of Brilliant Lights," "No One Higher" and "Cornerstone." Shust is currently in the studio recording his very first Christmas project slated for release in October of 2014. For more information on Aaron Shust, please visit www.aaronshust.com. The sound of MIKESCHAIR demands attention. The strong delivery of their self-titled debut album MIKESCHAIR and their follow up A Beautiful Life on CURB Records both set out to entertain as well as inspire those who listen. Their unique pop sound mixed with rock guitars, electronic textures, and bass grooves blended with catchy, anthemic, sing-along choruses compel you to step up emotionally and spiritually. Their music inspires action to change the world through love. Hailing from Belmont University in Nashville, Tenn., MIKESCHAIR continues to maintain their heart for missions to work and be involved with international relief agencies such as Food for the Hungry and Buckner International, organizations that help at-risk orphans. The band is currently gearing up for the release of its third studio album, All Or Nothing, slated to drop on April 1, 2014. For more information, visit www.mikeschair.com. Jonny Diaz began his music career by leading worship for a youth group in Lakeland, FL, and released his first independent project in 2003. Two more independent albums followed before Diaz signed with INO Records in 2008 and released his first major label national debut, More Beautiful You in 2009. The title track reached No. 1 on Billboard's AC Indicator chart, No. 2 on Hot Christian Songs chart and lead to strong reviews that included Christian Manifesto describing Diaz's music as "stellar acoustic pop." Another INO album followed, Jonny Diaz, which led to three more singles before Diaz departed from the label. An active touring artist, Diaz has shared the stage with such notable Christian acts as Building 429, Matthew West, Steven Curtis Chapman, MercyMe and Bebo Norman. For more information on Diaz please visit online at www.jonnydiaz.com. Singer/songwriter Lauren Daigle recently signed with Centricity Music and is set to release her debut project in 2014. Daigle hails from Lafayette, LA where she got her start in entertainment by appearing as a camel at 3 years old in a church play. That unique launch on stage led to Daigle becoming an "American Idol" contender in 2010 and 2012. Centricity Music discovered Daigle's incredible vocal talent at a Seattle artist retreat in 2012. Daigle was a last minute stand-in for the lead singer of another band when the singer became ill, and the entire Centricity staff was very impressed with Daigle's vocals. From there, Daigle was asked to sing background vocals on Jason Gray's hit single, "Nothing Is Wasted," and then joined Gray on his Christmas Stories Tour this past December. For further updates on Daigle please visit www.laurendaigle.com. For more info on MIKESCHAIR visit the JFH Artists Database. For more info on Jonny Diaz visit the JFH Artists Database.